Some Android tablets have unique features that set the devices apart from Apple's iPad 2. Toshiba is offering its Tablet with a replaceable battery option, which users can buy for $89. Keyboards for Motorola's Xoom and Samsung's Galaxy Tab are available with specific keys that make it easy to use and navigate the Android OS. Other handy accessories such as M-Edge's Convertible Sleeve can be used for both e-readers and tablets. Some accessories, such as the Wireless Keyboard, provide additional functionality to Motorola's Xoom. The full-sized Wireless Keyboard enables users to type on the Xoom via a Bluetooth wireless connection. The feature that sets it apart from other wireless keyboards is shortcut keys designed to provide quick access to Android applications. But at $69.99 it is expensive. The keyboard also works with Motorola's Atrix 4G smartphone, so the accessory may be worth the price if you own both devices. Motorola is also selling a speaker dock for $129.99 and a standard dock for $49.99, both for the Xoom. Motorola's online store also offers an HDMI cable at $39.99 to connect the Xoom to high-definition TVs. The site also offers cases and covers for $29.99. Samsung's Galaxy Tab is available with a 7-inch screen, though a 10-inch version is due out later this year. The company offers the Full Size Keyboard Dock, which offers more features than the product name suggests. A dock at the top can keep the Tab charged and connect the tablet to the keyboard. Another cool feature is a headphone jack outlet at the back of the keyboard, which could be handy when trying to maintain silence. It's unclear if the dock will accommodate the upcoming 10-inch Tab. 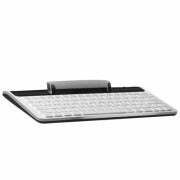 The Keyboard Dock is priced at $79.99 on Samsung's website. 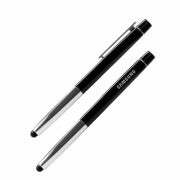 Other Tab accessories include Samsung's $19.99 Conductive Style, a digital pen stylized like a "premium writing instrument," according to the company. A range of covers and cases are available on Samsung's website, with the protective covers priced at $29.99, and leather cases starting at $49.99. Staples also houses some accessories for non-Android tablets like Research In Motion's BlackBerry PlayBook, a 7-inch tablet that will begin shipping in mid-April starting at $499. Included are a $69.99 Rapid Charging Pod, a $49.99 Leather Convertible Case and a $59.99 Leather Book Binder, which looks like an e-reader case. Accessory maker Targus has listed a nylon Truss case for the PlayBook, which is listed at $34.99, though it is not yet available for order. 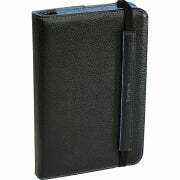 Targus is also offering a leather Zierra portfolio case for the PlayBook priced at $54.99. M-Edge is selling a $29.99 sleeve that can be used not only for Samsung's Galaxy Tab, but also Amazon's Kindle and Barnes & Noble's Nook e-readers. Calling it "Convertible Sleeve," M-Edge says the jacket gives users the "best of both worlds by combining the functionality of a jacket with the security of a sleeve." The front of the sleeve has four small pockets on the edges to hold a tablet or e-reader when in use. Vogel's offers Ringo mounts to place the Samsung Tab and iPad tablets on walls or car backseats. The Ringo Wall Mount can be screwed into a wall, and tablets can be placed into a holder that can rotate 360 degrees. With the Ringo Car Mount, a tablet can be mounted on a backseat. The tablet mounts will become available worldwide in late April, and are priced between $69.99 and $99.99. Toshiba Tablet, an upcoming 10.1-inch tablet, will include the unique ability to replace a battery, a feature not available in competing tablets. Toshiba says consumers have to only be "screwdriver savvy," and a replacement battery is already available for pre-order on Staples' tablet promotion site priced at $89.99. Other accessories for Toshiba Tablet listed include a case ($39.99), a back cover ($19.99) and a tablet pen ($14.99). In all, the Staples tablet website is a good one-stop shop that lists accessories for Toshiba Tablet and other devices. The release date and price for the Toshiba Tablet have not yet been announced.